Continuing with our theme of dyeing with plants we can find nearby, or waste from the kitchen, we had a go at dyeing with coffee. That is dyeing with the spent coffee grounds scraped out of the cafetiere. We saved them up in the freezer, and once freezer crisis was upon us, used them up. The process is simply a matter of boiling up the used grounds (making the house smell very strongly of coffee) leaving it over-night, straining it through a fine strain (I guess coffee filter paper would be the thing, we used kitchen towel), then the wool went in the dye bath and heated for an hour or so, and left over-night. In the top picture is the straight coffee, making a mellow golden colour, and the exhaust, a paler muddier version, shown on the right. And then we tried another dye bath and added an iron modifier. 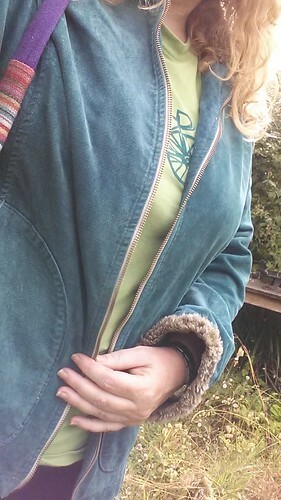 I was quite surprised at the soft green – iron is sad to ‘sadden’ the colours, but I wasn’t expecting a green. It’s nice though. 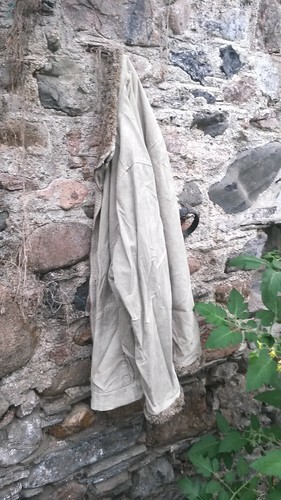 Ever since we started experiementing with natural dyes, I have fancied a dyers garden – filled with woad, weld, and madder and all the plants I could need. It’s not quite worked out like that – for a start we just dont have one huge patch of ground I want to dedicate to dyes alone. So far we have dyed with weeds and hedgerow harvests, and the woad was tucked into a corner of the veg patch. Madder has taken ages for me to get hold of, until a kind forum member sent me some plantlets – and they are still in pots until they get a bit bigger and as for weld – we have decided we don’t need it as we can get really bright yellows from the exhaust dyes from onion skins. We would like to grow woad on a grander scale though, as dyeing with woad is fun, and blue is a desirable colour, and deeper blue would be better still. Besides the flowers are a nice bright yellow, so look nice in the garden. 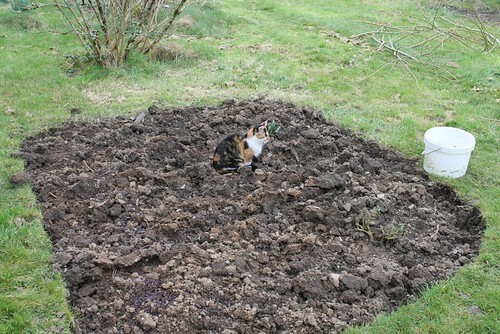 So we have been digging up the lawn again (no bad thing as well still have too much lawn) and made a woad bed. Into this we planted a couple of sorry plants left over from harvesting last year, and scattered a gazillion seeds (harvested from last year’s plants)- and you can see Molly is helping to firm them in. I’ve also sown some woad seeds indoors as a backup. I’m hoping for lots of woadlets. It is amazing how many colours you can get out of one plant, in the case of woad. 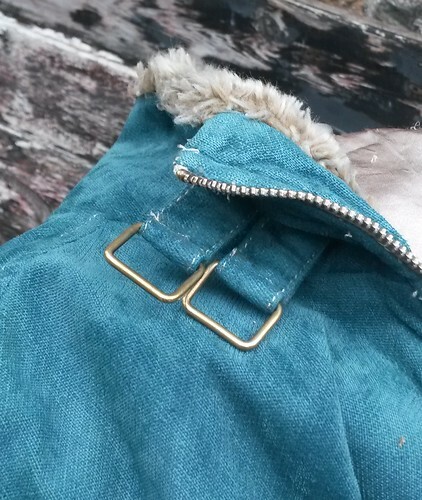 Having dyed a nice gentle blue, and achieved a bright green by overdyeing, using woad in the traditional way, another, less exciting colour can be obtained by exhaust dyeing. 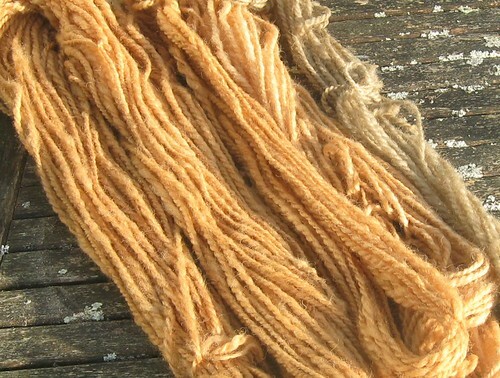 The leaves that were strained when dyeing with woad, were put through another round in the dye pot. They were boiled up in fresh water for about an hour, then left to sit, then strained and the liquid reheated, a skein of wool added, and simmered for another hour then left overnight. Last time we did this the resulting shade was a muted pale pinky colour, so this deep coppery colour was a pleasant surprise. We followed with a further dip and got the paler golden shade. And that was that for this year’s woad harvest. 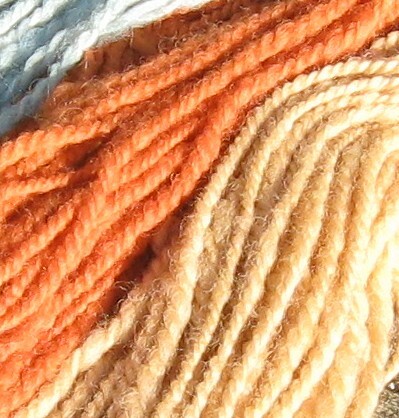 Pretty satisfying, and now I have more wool in my natural dyed stash (never a bad thing). The hastily pre frost harvesting of woad (we never did have a frost, but there you go) was duly processed, again using Sally’s excellent instructions. 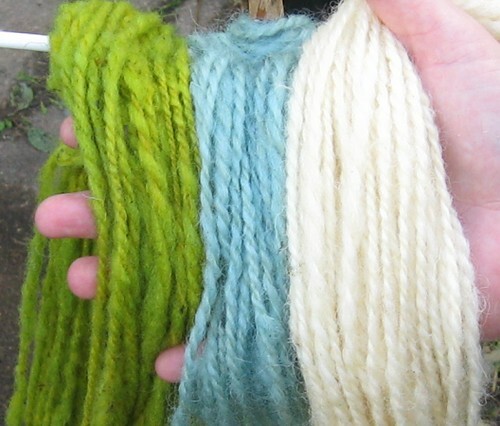 On the right, the undyed yarn (Devon Closewool wool), centre: woad, and on the left, pre dyed with onion skins, it started as a zingy yellow, before being dipped in the woad dye bath. This was our entire woad harvest, but only about 4 large plants. Next year we plan to make a dedicated woad bed, and why not when the flowers are so pretty, and the woad plants wont have to fight for space with the veggies. I can see we are many years away from getting bored of dyeing with woad. 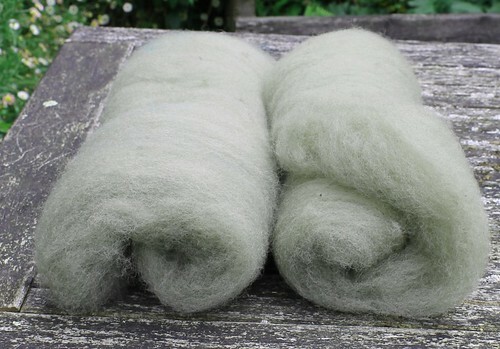 After a bit of faffing about whisking and getting the oxygen out etc, eventually you have a dye bath into which you drop white wool, leave it for a few minutes, pull it out and it looks green, then slowly turns blue as the air gets to it.